I am grateful to have the opportunity to rest my feet, to not worry about pushing through the rain or cold. Grateful to not have to dread possibly facing the treadmill when I save my workout for the end of the day. I am grateful that it happened. That I pushed through those excuses. That I experimented with different types of runs – treadmill intervals, short sprints, long runs, short runs, solo runs, group runs, 4-legged-friend runs. I ran in the early morning, middle of the day and “late” at night. I am thankful for the healthy body that allowed me to complete the challenging task – for my legs to carry me through the miles, my brain to ignore my legs when they said “no we won’t go” and my spirit for staying positive. And for all the other spirits who followed my journey – encouraging and supporting me along the way! I am grateful for the jump start on my 1,000 mile goal for the year! In 31 days I logged 121.26 miles over 32 runs. My longest run was 10.8 miles and my shortest .33. Here’s to February! What are you thankful for today? Day 31 – The Final Run! Of the challenge anyway! Of course you know my running adventures are far from over – otherwise this blog would not survive! I DID IT – 31 DAYS OF RUNNING EVERY DAY! Weather notes – 66 degrees, gotta love January in the Midsouth! Also dodged sprinkles for about five minutes early in the run. Other Notes – I ran with Libby before I taught Bosu ball. We kept the pace and conversation light (my legs were sore and tired from the half marathon yesterday! ), discussing Super Bowl plans and previous weekend’s activities for most of the jaunt. What else can you think of? What will you try to accomplish in February? I realized today I was almost out of January days to fit in my monthly 13.1 miles! There’s no way I was going to let this goal get away from me in the first month of the year! Luckily I had a large block of time between morning and afternoon clients to hit the pavement. January 30 – Day 30/31. Weather Notes: Warm – 59 degrees and windy when I started. The sun was shining brightly and I’m pretty sure I have tan lines (crazy in January!) from my almost two hours on the trails. Other Notes: I hadn’t run on the Farms trail in a long time and was really looking forward to combining the 10k route with my favorite part of the Greenline. It was nice to combine a favorite race course and the straight and narrow of the Greenline. I wore a tank top and was completely comfortable but people looked at me like I was crazy while the ran in their long sleeves and jackets. Whatever, I got a tan. Unfortunately I got started later than I hoped and wasn’t able to complete the entire 13.1 miles in the run so I promised myself I would finish later……. Other Notes: I finished up my monthly half-marathon distance (can’t miss that goal in the first month!) on the treadmill this afternoon before class. I just started reading The Time Traveler’s Wife and wanted some quality time with it while I ran. 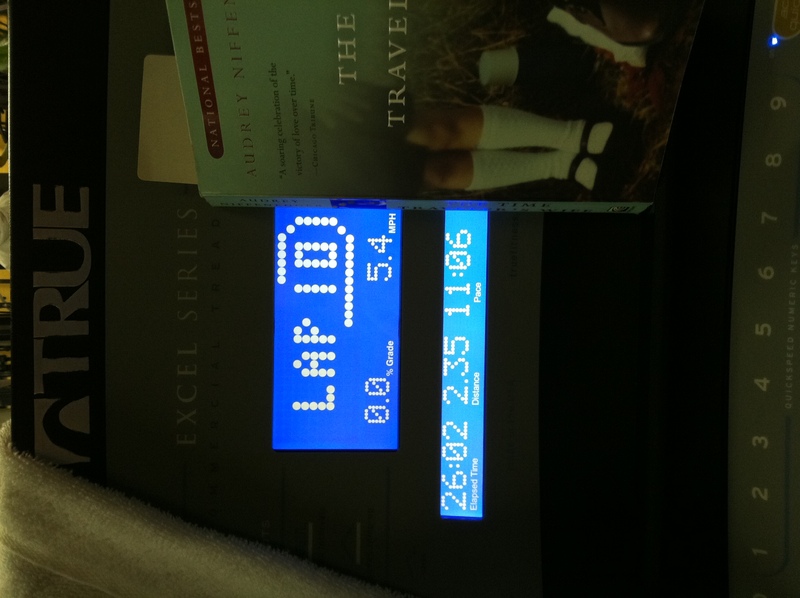 It took some experimenting to figure out the pace that I could run and see the words clearly and comprehend them and balance the book on the treadmill dashboard in front of me. 5.4 miles per hour is my perfect book reading pace. Now I get to move 6 rocks from my “Miles to Go” jar!